Planning your child’s future is made simple with the School Details Template. This simple document is your saving grace when it comes to planning every aspect of your child’s school information. Whether it’s their teacher, principal, or nurse contact information or it’s their daily homework schedule, this template has everything you need to plan for your children’s academic success early on in life. The School Details Template also gives you an active window into your child’s schoolwork. Staying involved is the best way to help them excel at school and this template is the perfect tool to help you accomplish that goal. To download the free template file directly to your computer, just click the link at the bottom of the page. When you have the document downloaded and opened, you can start customizing the template in the “School Details Basic” tab. In this section, you can enter all the contact information of multiple teachers and other school officials that you need. 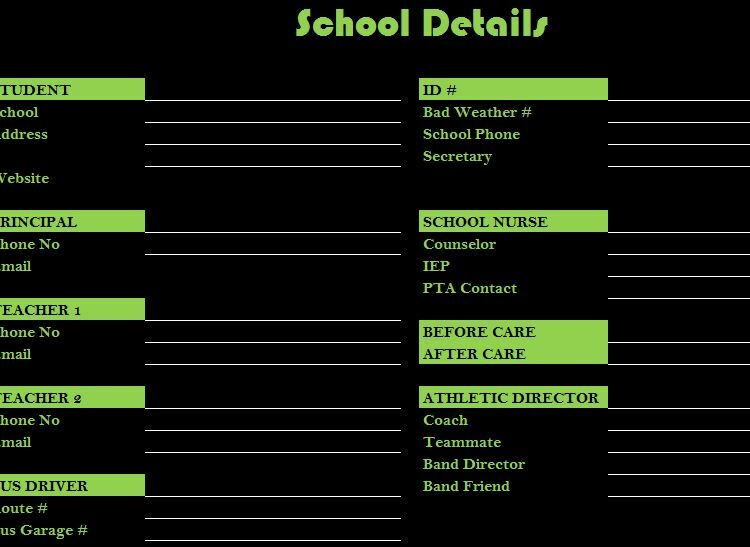 The “School Details Basic” section was intended to provide you with important contact information should an emergency arise or you would just like to speak with one of your child’s teachers about their performance in school. The “School Details 2” gives you a space to list your child’s school schedule in the weekly calendar at the top of this page. You can also include important lunch and school policy information as well. You can use this tool to stay more involved in your child’s school-life and help them with any of their academic needs. You can easily reuse this template for every year of your child’s early education. Quickly edit any of the information to suit your child’s needs. Simple format makes staying involved simple.